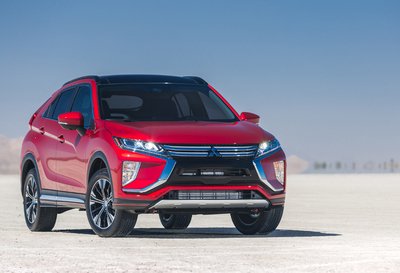 Mitsubishi is probably banking on the fact that you no longer remember the name "Eclipse." It once designated a fine sporty compact coupe the company produced years ago. Now they've resurrected Eclipse for their all-new compact SUV for 2018. It's called Eclipse Cross. They added the "Cross" because it's a car-based crossover SUV. 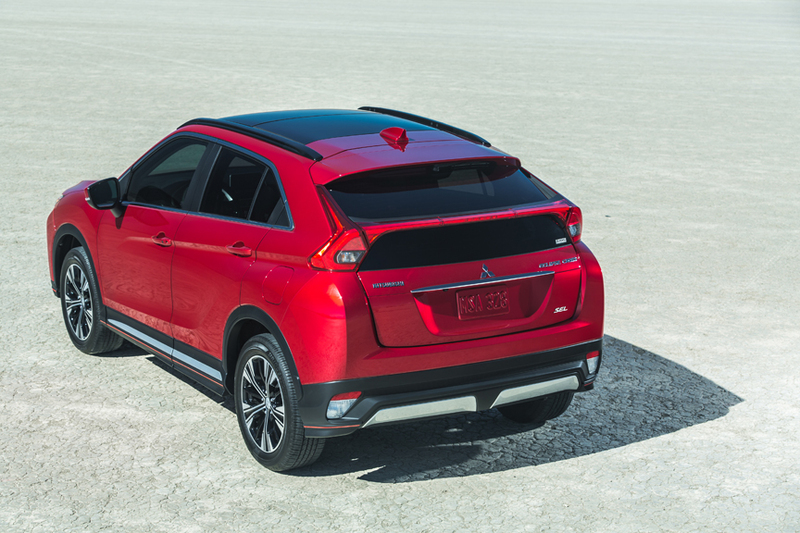 In size, this new Eclipse Cross falls between Mitsubishi's two other SUVs, the Outlander and the Outlander Sport, both of which continue to be offered. The Eclipse is 7 inches longer that the Sport but 9 inches shorter than the Outlander. In terms of curb weight, the Eclipse Cross, at 3,515lbs, is closer to the Outlander (3,610lbs) than the flyweight Sport (3,290lbs). All three Mitsubishis share the same basic platform, but at 106 inches, the Eclipse boasts an extra inch of wheelbase over its stable mates. It's also an inch wider than the Outlander and 2 inches wider than the Sport. Price range of the Eclipse Cross starts at $21,000 for the base model and rises to $26,395 for the SE we drove for a week. Only the base version offers front wheel drive. Upscale SE models provide all wheel drive, which the company rather confusingly labels "S-AWC" for "super all wheel control." A 1.5 liter inline four, direct injected and turbocharged, produces 161hp in all versions. This rather lively engine connects to a whiny CVT transmission which provides eight detents to mimic gear ranges. If you want a manual transmission in a Mitsubishi SUV, your only choice is the 5-speed stick available in the Outlander Sport. Although the CVT offers no steering wheel paddles, you can control shifts and engine speed range by slotting the stubby floor stick into its manual gate. This "Sport Mode" is located to the left of the normal "Drive" range. By bumping the stick forward for downshifts and backward for upshifts, you can exert primary control over engine performance, albeit at the penalty of noisy feedback when the tachometer sails past 5000rpm. Included in the specification sheet of the SE is a no-cost wheel/tire upgrade from the base model's 215/70R16 radials mounted on 6.5Jx16 rims to much preferable 225/55R18 rubber using 7Jx18 inch alloys. The Bridgestone Ecopia tires on our Eclipse Cross proved their mettle in a spirited run up the Coast Route, never deviating from the chosen line nor howling in protest at sudden changes in direction. Indeed, this latest addition to the Mitsubishi stable is an impressive back road performer. Mitsubishi's long experience in winning rallying World Championships shows in the Eclipse's refinement. 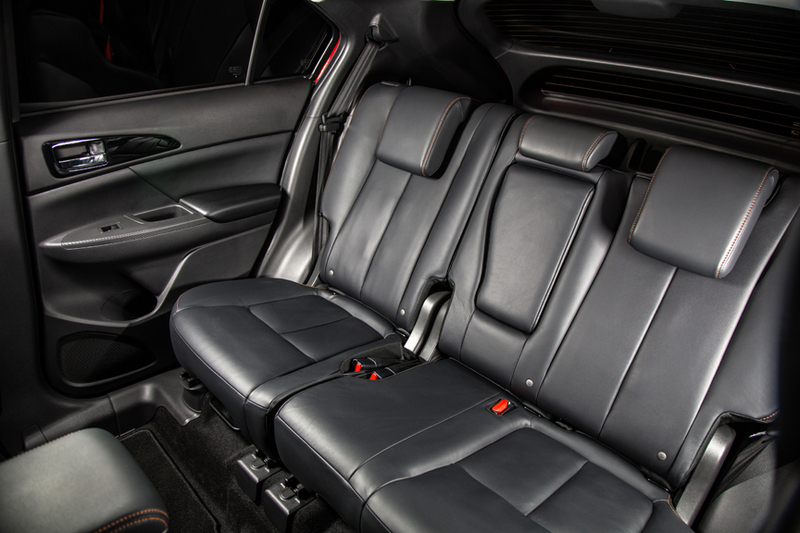 Its competence can be attributed in large measure to the fact that the company has not skimped on the suspension underpinnings you never see from the driver's seat. For example, both front and rear suspension systems are fully independent, and both utilize sizeable stabilizer bars to eliminate compliance slop in turns. Visibility from the cockpit of the Eclipse Cross is excellent, thanks in particular to the unusual dual window pane configuration of the rear liftgate. From the outside, you can't even tell the lower panel is glass, since it's blacked out to match the Cross' "Tarmac Black Metallic" exterior paint. If every automotive designer provided this kind of sensible rear window treatment, there would be no need for expensive back-up cameras and rear cross traffic alert systems. The Eclipse, by the way, includes both of these systems, should you chose not to trust your own eyes. Also standard are Blind Spot Monitoring and Lane Change Assist. Standard issue inclusion of these safety nannies causes me to wonder just why the Eclipse dashboard contains no less than 10 (!) unused rocker switch locations. 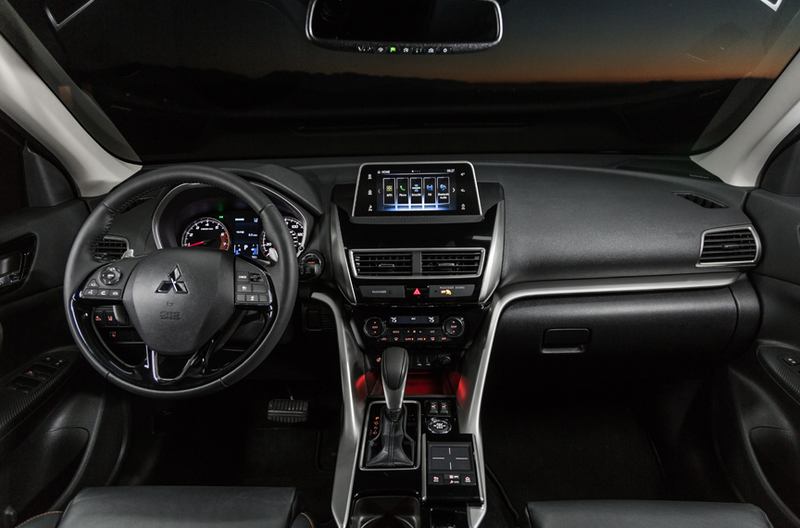 It almost seems like Mitsubishi borrowed the dash panel from one of their aircraft division parts bins. Whatever the reason, the Eclipse's blank plates make you wonder what might be available that you're not getting here. One switch that needs relocation, however, is the Start Button, which is hidden so high up behind the steering wheel that you're always struggling to find it. Ironically, Mitsubishi blanked out the more conveniently located lower ignition slot presumably used for base model, key-start Eclipses. GRIPES: What's With All the Blanks?